These free birdhouse plans include everything you need to build a birdhouse for your yard. You'll find detailed instructions, diagrams, photos, and materials and supplies lists. Some of the plans even include videos and user tips. Before you choose a free bird house plan you'll want to decide where you're going to put the finished house. This will help you decide what type (tree, hanging, pole, etc.) and size of birdhouse you should choose. Some birdhouses are better than others for certain types of birds. Choose a plan with an entrance hole size that makes sense and is a size that allows the birds plenty of room to nest. Here are the free bird house plans. You'll find everything from simple birdhouses to more advanced homes. Be sure to click on each of the links to find instructions, diagrams, and photos. Basic Birdhouse Plan: Here's a free bird house plan that's great for the beginner woodworker or those looking for a quick project. One-Board DIY Birdhouse: This is an incredibly easy bird house plan that uses just one pine board to make. Backyard Birdhouse Plan: Here's a very cool looking free birdhouse plan that will make your backyard birds feel like royalty. Modern Birdhouse Plan: This modern looking birdhouse uses only half a cedar fence picket to create. Hanging DIY Birdhouse Plan: This pine birdhouse hangs from a chain that you can hang from a tree or structure. Red Church Bird House Plan: This plan will build you a bright red church for your birds. Pole Birdhouse Plan: Use this free plan to build a simple birdhouse atop a pole that you can put into the ground. Bird's Nesting Box: Here's a plan for a nesting box that will keep your backyard birds cozy all winter. Nesting Box Free Plan: Here's a beginner bird house plan that encourages you to change the plan as needed for your space. License Plate Birdhouse: Most of this birdhouse is built with wood, but a metal license plate makes up the roof. Simple Bird House Plan: This plan will get you a very simple and straightforward birdhouse that can be nailed to a tree or post. Green Roof Bird House Plan: Wrens and chickadees will especially love this birdhouse that you can grow plants and flowers on top of. 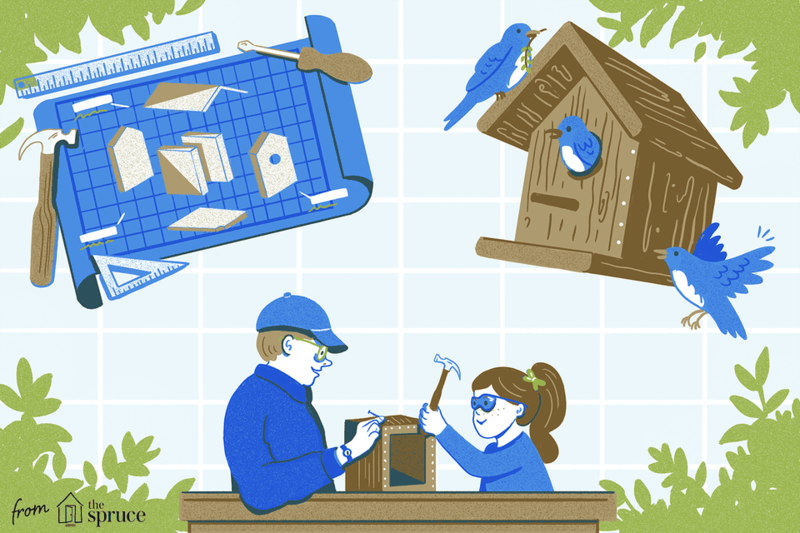 DIY Bluebird House: This birdhouse plan features a great design that can be put together in an afternoon. Nesting Shelf Birdhouse Plan: Here's a birdhouse plan that includes a shelf where the birds can build their nest. Teacup Bird House: No, this isn't a birdhouse made out a teacup, it's a wooden birdhouse in the shape of a teacup. Whimsical Birdhouse Plan: You really have to check out this free birdhouse plan, it's truly a piece of functional art. The Tall Texan Birdhouse Plan: This Tall Texan bird house plan will be sure to attract a lot of birds this spring. DIY Birdhouse Plan: Here's a plan for a straightforward birdhouse that will give the birds protection and allow them to sit outside. House Sparrow Bird Box: Use this plan to build a bird box just for house sparrows. Place it under your house easements to get the most use. Bluebird Bird Houses: Your bluebirds will love these simple birdhouses that are nailed to trees. Log Cabin Bird Houses: Make your birds this log cabin style home and they'll want to stay forever. Modern Birdhouse: Not all birdhouses have to be boring, and this modern one will make you smile. Looking for your next project? I have a ton of free woodworking plans including free plans to help you build a picnic table, shed, dog house, cat tree, tree house, rabbit hutch, chicken coop, jewelry box, and much more. What Is a Cavity-Nesting Bird and What Cavities Do They Nest In?